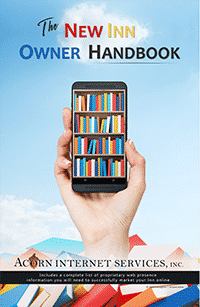 Make sure you have a copy of our New Inn Owner Handbook! Click to request a copy. You have a Dream? It doesn’t have to become a Nightmare! How to Start a Bed and Breakfast? How to Open a Bed and Breakfast? How to Run a Bed and Breakfast? How to Own a Bed and Breakfast? Please allow us to be the one to provide you with honest answers and quality assistance! Acorn presents 4 New and Aspiring Webinar each year - one per quarter. Check back for the latest webinar date and topic. May 2015 Who Will Build Your Website? April 2013 DYI or Pay Someone? February 2012 What about E-Mail for your Business? Acorn Internet Services offers Webinars, specifically designed and developed for New and Aspiring Innkeepers to our already extensive list of educational services. At this time this educational offering is at no charge. Our Aspiring Innkeeping Webinars include Real Live (Successful) Innkeepers sharing their stories and advice, along with a basic skills technical topic, Q&A and homework. We’ll be providing these Aspiring Webinars each quarter, and they are be recorded for future reference. Finally, we’d like to provide you with an extensive “To Tell the Truth” Check List of items that Innkeepers must deal with sometime (and sometimes many times) during their years of Inn ownership. Take a moment and read through the list. Answer each question either with a “YES” or a “NO”. If you find yourself answering “NO” and you are simply not interested in learning how, you will need to make sure your future Inn provides highly lucrative Revenue numbers, as all these tasks are MUST do’s. If you CHOOSE not to do or learn to do, you will need to PAY a professional to handle it for you. Innkeeping is a highly rewarding and incredibly fulfilling career choice. But, as I speak from experience, it will be one of the hardest jobs you will ever do! There’s no time like the present to begin preparing for a successful career in Innkeeping! If you are an Aspiring Innkeeper who is currently looking for a viable property, I encourage you to look through our Acorn University Students who have their Inn’s on the Market. These are highly educated Innkeepers that are employing our Marketing Techniques to make their Inn’s profitable. A great match for Aspirings that are learning those same topics as part of our Aspiring Program above. Click Here to see the current Inns for sale. Register for ongoing Educational Announcements and updates regarding our industries continuing changes that impact the success of your online presence.